DEAR MAYO CLINIC: I recently was diagnosed with breast cancer at 65. I have a strong family history of the disease. However, my doctor hasn’t mentioned genetic counseling or testing. Is this something I should bring up? 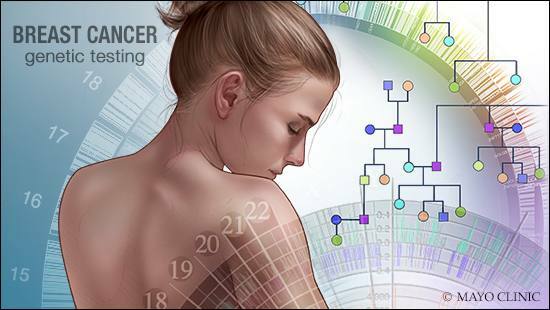 ANSWER: Only about 5 to 10 percent of breast cancer cases are thought to be hereditary, meaning that they result directly from gene defects (mutations) passed on from a parent. For that reason, genetic testing isn’t routinely recommended. However, women with strong family histories of breast and other related cancers are one of the exceptions to this rule. There are several good reasons to talk with your health care provider about testing. A genetic test involves taking a blood or saliva sample, and analyzing your DNA for gene mutations that can increase your risk of developing cancer. Ideally, your health care provider will first refer you to a genetic counselor, who will collect the family history, and discuss the risks and benefits of genetic testing. The genetic counselor also will review other important issues associated with testing, such as cost, insurance coverage and your rights under genetic discrimination laws. Testing may be appropriate when a woman has a personal or family history suggesting an increased risk of breast cancer. Risks include having cancer in both breasts, having a certain subtype of breast cancer, or being younger than 50 when diagnosed. Other red flags include multiple cases of breast, ovarian or pancreatic cancer on the same side of the family; male breast cancer; or Ashkenazi Jewish heritage. Knowing you have a hereditary mutation can guide your treatment decisions. For example, if you carry a high-risk mutation, you may feel more comfortable undergoing a mastectomy, rather than a lumpectomy. You also may want to consider preventive surgeries, such as removal of your ovaries (oophorectomy). Ovaries produce estrogen, which, in premenopausal women, can feed estrogen-sensitive breast cancer. This procedure also lowers your risk of developing ovarian cancer, which has been linked to some of the same mutations as those that cause hereditary breast cancer. Knowing your genetic status may benefit your family, as well. If you test positive for a mutation, you can share this information with your relatives to allow them to weigh their own options. However, family members may not want to know. Discuss your decision to test with them and respect their wishes if they don’t want to know the results.